Comments: Thomas H. Childress was born May 4, 1840, at 'Seven Oaks' near Esmont, VA. He was the son of Robert M. and Lucy Overton Childress, a couple of some means in Albemarle County, VA. When the Civil War came, the 20 yr. old Thomas wasted no time in enlisting in Capt. 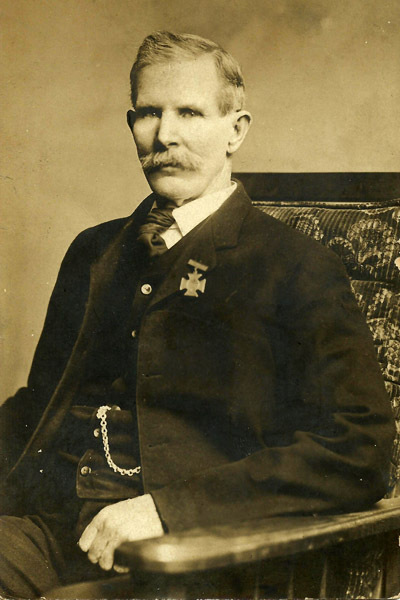 Albert Gantt's company of Virginia volunteers called the 'Scottsville Guard." Eventually this company would form Company C, 19th Virginia Infantry. By July 1861, the regiment formed part of P.G.T. Beauregard's army in the vicinity of Manassas Junction. The regiment fought in the first major battle of the Civil War, First Manassas, and Thomas' muster roll shows him as present during that time. The war in the east quieted down in time between First Manassas and the spring of 1862, and Thomas' regiment would not see any major action in that time. During this time Thomas contracted pneumonia, a disease that certainly could have meant death. He was detached from his unit stationed around Yorktown, Virginia, and treated first at the Chimborazo Hospital in Richmond, and then recovered at a place called Camp Winder, also in Richmond. 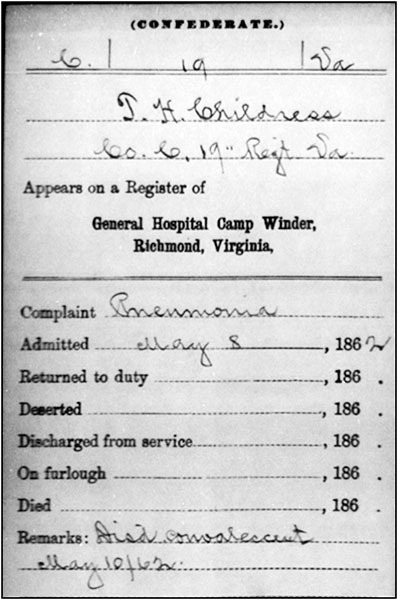 Following is the register of the General Hospital at Camp Winder that shows Thomas was admitted to Camp Winder on May 8, 1862, and discharged on May 10, 1862 to convalesce at an unspecified location. No record survives of Thomas' service for the rest of the summer of 1862, but his regiment was indeed quite active in the Peninsula Campaign and later the Seven Days battles during that time. This muster roll listed Thomas as absent since June 17 to find a horse, and so Thomas was not present with his regiment during the first part of the Gettysburg Campaign. During the retreat from Gettysburg, however, his 1928 obituary (shown in its entirety at the end of this article) states that he was wounded by a shell burst at Boonsboro, MD, where a battle occurred on July 8, 1863. Also serving in Thomas' new unit was his younger brother, John Childress. It's possible that Thomas was transferred from the infantry to the same cavalry company as his younger brother. Cavalry duty meant long hours in the saddle riding, and when the cavalry soldier wasn't riding, he was either taking care of his horse or on picket duty. The 15th Virginia Cavalry was attached to the Army of Northern Virginia and took part in famous battles like Yellow Tavern and Trevillian station during the Childress brothers' time in the regiment. No records survived from this period, so it is not know if they were or were not involved in these actions. There is, however, information offered in Thomas' obituary from 1928 that states: "At Louisa Courthouse, in the battle with Sheridan, he (Thomas) was injured in the hip. He was sent to the hospital in Gordonsville and after a few days was released on furlough. He made the trip home on foot, as his horse had been sent home by his comrade-in-arms, J.N. Thomas." By November of 1864, attrition had taken its toll in both armies, and consolidation of various depleted commands was necessary. The 15th formed part of the consolidated 5th Virginia Cavalry, and Thomas was transferred again to a new command. Not much is known about this period in Thomas' life either, but the 5th remained active until the close of the war. 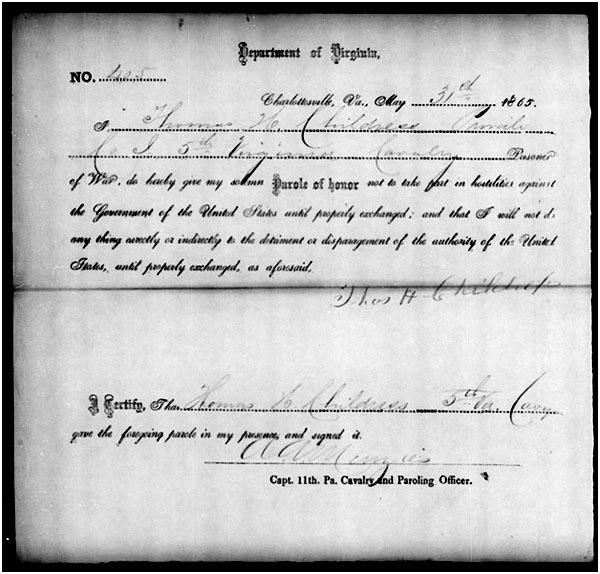 Thomas was paroled on May 31, 1865, and allowed to return home, as seen in his parole slip below. 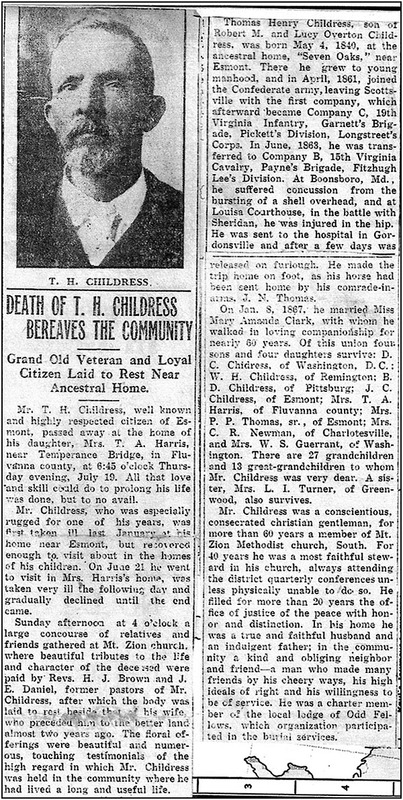 The 1907 photo of Thomas H. Childress, his Civil War record, and his 1928 obituary are part of the Dean R. Thews collection. Mr. Thews resides in Liberytown, Maryland, and is an avid Civil War enthusiast and friend of Scottsville Museum. Special thanks are also given to Mary Roy Dawson Edwards of Schuyler, VA, and Nancy Miller of Virginia Beach, VA, for sharing the Civil War records of Thomas H. Childress with Dean and Scottsville Museum. See also: Compiled Service Records of Confederates Who Served in Organizations From State of Virginia, NARA Record Group 109, VA; Roll 0618, 19th Infantry, Thomas H. Childress.